Escondido Police Chief Jim Maher defends city practices vis-a-vis immigrants during a 2012 KPBS appearance. Former Escondido Police Chief’s Jim Maher’s contentious employment end game finished in a swirl of controversy in 2012 that just got curiouser and curiouser on Monday. 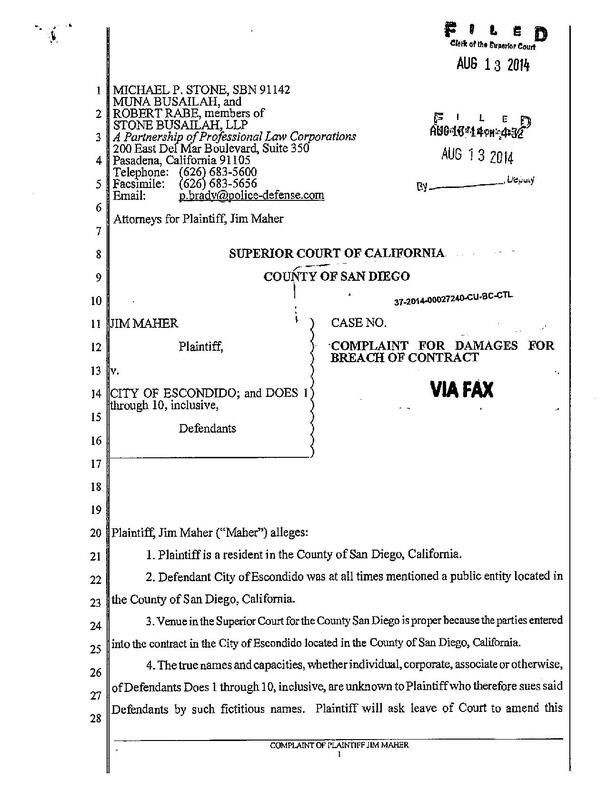 Escondido officials may, or may not, were served with this Maher wrongful termination lawsuit. Maher had filed a breach-of-contract suit last year contending he was owed $75,000 of a negotiated $150,000 job buyout. On Monday, his attorney told a reporter that the suit had been dropped. Rick Pinckard, Maher’s current attorney — Robert Rabe handled the case previously — said the matter was over while offering no further explanation. Maher, too, declined comment on the curious development. The contract breach suit was filed in August 2014 at San Diego Superior Court. It said Maher was owed the money under his November 2012 severance agreement that included a 14 percent raise that bumped his annual pension to $162,504, as well as a $150,000 cash payment that was to be broken into two installments. Only one installment was paid. Adding fuel to the controversial 2012 buyout was a non-disclosure agreement barring Maher and his wife Eva from talking about the agreement. He also wasn’t allowed to attend City Council meetings and official city of Escondido events. The first payment of $75,000 was made in January 2013. The lawsuit said Maher received a letter in June 2013 from city officials saying he had broken the nondisclosure agreement and forfeited the second $75,000 payment. Escondido City Attorney Jeff Epp said the city never was served with the lawsuit. Maher joined the force in 1980 handling public relations duties for a time. He was promoted steadily within the department before becoming chief in 2006. The severance situation proved controversial when it went down. City council members never took a vote on it. It was signed, approved and kept secret by Epp, City Manager Clay Phillips, the Mahers and their attorney. Then-Escondido Deputy Mayor Olga Diaz didn’t even see the agreement until later, characterizing it as expensive and overreaching. Details of the agreement only came to light after the American Civil Liberties Union filed a public records request. About 170 officers work for the Escondido Police Department. Maher, 60, first was placed on paid leave in September 2012 for undisclosed reasons. City officials said the action stemmed from an in-house matter that they would not disclose.